Technology has advanced far past what it was at when the first sewing machine was invented in 1790. Computerized sewing machines can take some of the hassles out of adjusting tension and choosing stitches. Automated sewing machines can also adjust speed depending on the cloth you are working on, as well as feeder grip and needle pressure, so you can get consistent stitches no matter the project. Computerized sewing machines also have easy to read computerized displays so you can keep an eye on your project as you stitch. This can help take the guessing game out of choosing stitches and adjusting tension, as well as give you a wide array of choices to pick from when working on your latest projects. In some cases, computerized sewing machines tend to be more expensive than their basic counterparts, but the help of the computerized system makes them more reliable than their counterparts and can help even the newest sewer feel comfortable on almost any project. While computerized sewing machines can take some of the guesswork out of sewing with various tension and stitch settings, there can be a learning curve for each machine depending on their unique settings and interface. Thankfully, many computerized sewing machines have tutorials online that can help you get a feel for your new machine without getting frustrated or overwhelmed by a large number of settings available. Make sure to keep in mind the kind of project you are hoping to take on with your new machine, as not all computerized machines are right for every project, as there can be some differences from one computerized system to another. Without further ado, here are the best computerized sewing machines for general use. One of the biggest perks of the Janme 330 Magnolia COmputerized Sewing MAchine is its adjustable pressure foot. This allows it to take on bulkier fabrics, like denim and some minor upholstery projects without jamming. With 30 stitches to choose from, as well as easy-to-use tension and stitch width settings, this is a good basic computerized machine for beginners and advanced sewers alike. As one reviewer noted, “I like the easy to operate features of this machine. It is lightweight and sews beautifully.” The only downside to this machine is that it is simplistic in its options, which makes it perfect for anyone who is learning the ropes of computerized sewing machines but might not be as useful for someone looking for an all-around sewing machine to take the brunt of their projects. But its simple design makes it intuitive for anyone looking to branch out into computerized sewing machines, and the magnolia motif on the outer casing is an adorable touch. This Sparrow 25 bundle has what you need to get started on your next project. With 185 stitches to choose from, this sewing machine is a true workhorse. The Brother Designo Series DZ2400 comes with adjustable needle control, backlit LCD display, and variable speed control to help you avoid missing stitches on thicker fabrics. It’s also an ideal machine for quilting thanks to its durable design and easy-to-control from. It’s also an intuitive machine, like most computerized sewing machines, making it the perfect choice for sewers of all ages and skill levels. One reviewer reports that “The decorative stitches are easy to use and fun! I’ve let my young grandchildren use the machine. The settings for stitching are completely user-friendly.” This machine is a great investment for anyone looking to invest in a more complex computerized machine that can take on a wide range of projects. The first thing that sticks out about this machine (outside of its pink design, of course), is its wide range of available stitches to choose from. With 197 computerized stitches, you’ll never fight against tension problems again when switching between different designs. This handy machine has 15 needle positions to choose from, as well as an automated dog feeder to help with heavier projects. 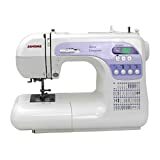 What this machine doesn’t have in bulk, it makes up for in ease of use, as one reviewer said, “this machine is SO much smoother, quieter than my old machine.” This machine is ideal for faster projects and is a good all-around sewing machine for anyone looking to upgrade their sewing machine. 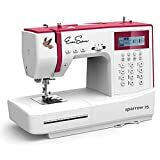 With a max stitch speed of 850 stitches a minute, the Eversewn Sparrow 25 is a great sewing machine for routine projects, as well as heavy workloads and free-form quilting projects that require that extra jolt of maneuverability. 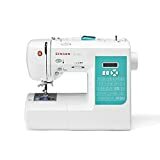 With over 2,700 customer reviews and an overall 4 ½ star rating, this sewing machine is the clear option when it comes to choosing the best computerized sewing machine on the market. It “Never misses a stitch, it is very easy to use and sews over all different types of light fabric and it does the job pretty well” according to one reviewer, and while it has fewer stitches to choose from than our second option on this list, its computerized needle settings, and easy-to-use stitch and tension selection system makes up for this with flying colors. The SINGER 7258 100-Stitch Computerized Sewing Machine also comes with nine different feet for a wider range of projects and has a good balance of intuitive design and general usefulness that makes it the clear choice for the best computerized sewing machine on our list. Whether you’re looking to customize your stitch width or invest in a reliable computerized sewing machine that will take your projects to the next level, you’ll never be disappointed with the SINGER 7258 100-Stitch Sewing Machine.